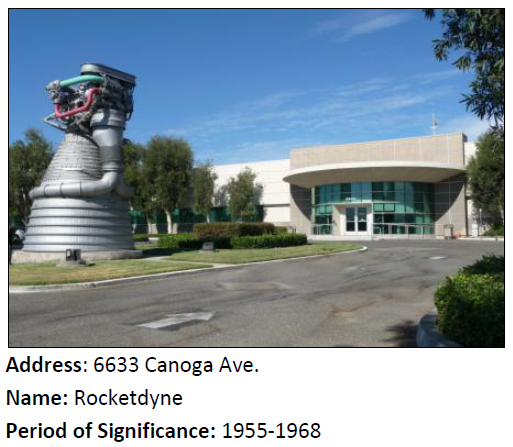 1955-68 – 6633 Canoga Ave.
That beauty out front is a Rocketdyne-designed F-1 engine, the kind used to send the first human beings to the moon. The aerospace industry has been an important source of jobs for the area as well. SurveyLA – the Los Angeles Historic Resources Survey – is Los Angeles' first-ever comprehensive program to identify significant historic resources throughout our city. The survey marks a coming-of-age for Los Angeles' historic preservation movement, and will serve as a centerpiece for the City’s first truly comprehensive preservation program.